Migraine is a severe recurring vascular headache occurring more frequently in women than men. It presents itself as a one sided headache; usually the sufferer feels a pounding disturbance as if just behind the eye - either left or right. The aching usually will be aggravated when one perceives bright lights, loud noises around him, or tries to bend over. Most migraine sufferers usually feel some kind of relief or solace in dark places – away from the light. Migraine pains sometimes tend to switch from one side of eye to the other, or frequently occurring behind the same eye. Migraines are described as vascular headaches and theories abound as to the real or actual cause of migraines. But it is clear that the pounding pulsation that the sufferer experiences is as a result of the constriction and dilation of blood vessels. However, some researchers have also stated that this experience could be due to the fact that the patient may be lacking in the chemical found in the brain called Serotonin – a neurotransmitter that is involved in activities such as sleep and depression, as well as memory. If you have been having problems emptying your bowel, that is to say you are constipated and having indigestion, then try taking more water. Take at least two and a half litres of water daily because accumulation of toxins as a result could be the cause of your problem. 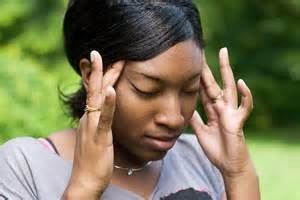 But you must be pleased to hear that there are a few available natural approaches to handling migraine even right there in the comfort of your home. Hot and Cold Packs: Applying hot packs to the affected parts can actually relief your usual headaches since heat helps to increase blood flow to the neck muscles helping to relax them. But cold or Ice packs applied is usually used to get good relief from migraines. This happens because the cold is able to constrict blood vessels thereby preventing the headache from progressing along its painful course. Breathing Exercise: You must also know the role that oxygenation plays in your body. Thus you should learn to do deep breathing often, being careful also to do this in an area where the air at the moment is clean and refreshing. I emphasise this because our environment today especially in Nigeria is highly polluted – what with the exhaust fumes here and there, especially from power generators, vehicles, and the rest. You could lie on your back and do deep breathing using your diaphragm or what may be referred to as stomach breathing wherein your stomach goes up and down in the cause of breathing. This simple exercise helps to circulate oxygen thereby relieving stress that causes migraine. Aerobics: Also if you are able to maintain a regular aerobics exercise habit, you may likely have sounder sleep which will normally keep your migraines away as well. Aerobics are cardiopulmonary exercises that increase the need for oxygen, encouraging a gentle and unhindered inhalation and exhalation of air while you carry out the necessary simple workouts.